DOOMSDAY ‘This would be a horrible humanitarian tragedy,’ says Noam Chomsky of Trump’s deportation plans. Retired MIT linguistics professor Noam Chomsky issued a video message Dec. 23 regarding the critical problem faced by undocumented immigrants on the verge of a Trump presidency. "President Obama, to his credit, has issued personal pardons in deserving cases, but he should go far beyond," Chomsky stated. On Dec. 19, just weeks before leaving office, Obama pardoned 78 people and shortened the sentences of 153 other prisoners. The recipients were all nonviolent, low-level drug offenders deserving of a second chance. In total, Obama has pardoned over a thousand individuals since taking office, more than 50 times that of George W. Bush. Chomsky then dared the president to set a new record. "He should proceed to what is, in fact, an urgent necessity: to grant a general pardon to 11 million people who are living and working [in America], productive citizens . 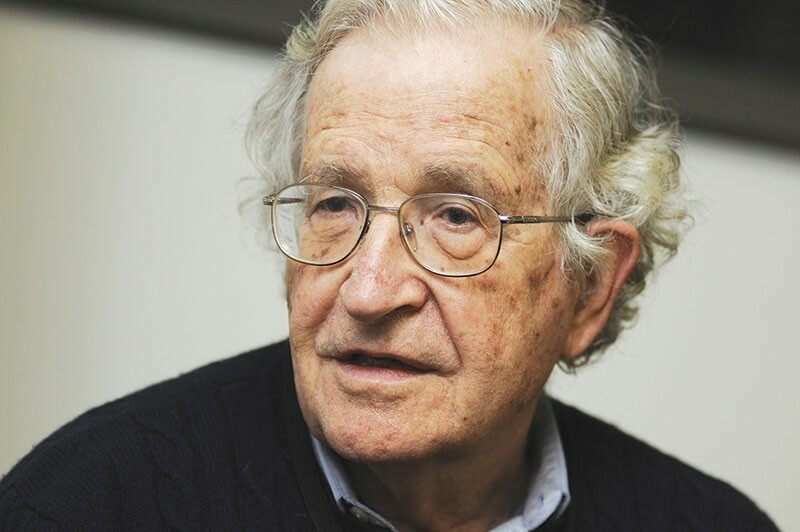 . . threatened with deportation by the incoming administration," Chomsky insisted. Donald Trump has promised to immediately deport 2–3 million undocumented immigrants. Meanwhile, the White House has shut down the House Democrats' request for Obama to pardon DACA (Deferred Action for Childhood Arrival) recipients through his executive power. "As we have repeatedly said for years, only Congress can create legal status for undocumented individuals," a White House official told BuzzFeed. President-elect Trump said in early December that he would "work something out" for the DACA Dreamers. But considering that Trump campaigned on the promise of deporting every single illegal immigrant, Chomsky isn't too hopeful. "This would be a horrible humanitarian tragedy," Chomsky said of Trump's deportation plan. "And moral outrage can be averted by a general pardon for immigration infractions, which the president could issue," Chomsky said. According to Peter L. Markowitz, a professor at the Benjamin N. Cardozo School of Law, it's possible. "President Obama can still act to bring humanity and justice to an immigration system notoriously lacking in both. He can do so by using the power the Constitution grants him—and only him—to pardon individuals for "offenses against the United States," Markowitz explained in July, just three weeks before Trump officially became the GOP nominee. Markowitz then revealed that the president's pardon power does not solely apply to criminal offenses, and can be used to grant a fairly wide range of amnesties. "It's a common assumption that pardons can be used only for criminal offenses, and it's true that they have not been used before for civil immigration violations. However, the Constitution extends the power to all 'offenses against the United States,' which can be interpreted more broadly than just criminal offenses," Markowitz said, citing Jimmy Carter's 1977 pardon to half a million draft violators. Chomsky had a request for viewers, as well. "We should join to urge [President Obama] to carry out this necessary step without delay," he added.